54,194 others viewed this post. 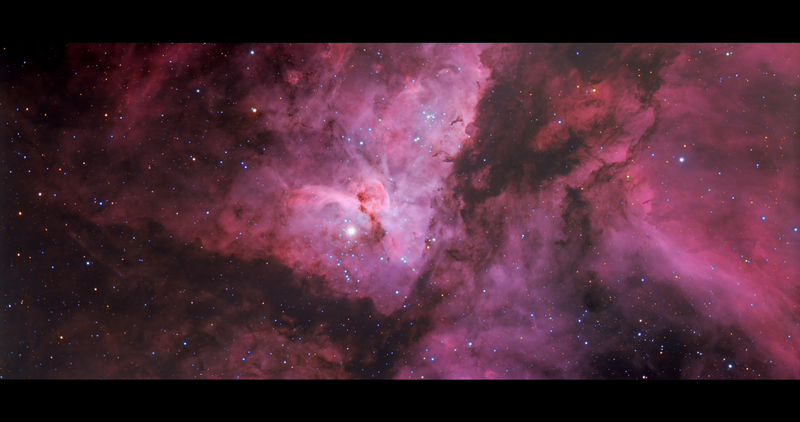 I don’t normally do this but here is a 4K resolution version of the inner region of the Carina nebula. It’s a 2-panel mosaic and close to the full raw resolution so if you download the file and zoom in you get to see all the noise imperfections and colour mapping distortions and all that other embarrassing stuff. But if you stand back and squint your eyes and pretend Hubble sent you this natural colour image of the Southern Hemisphere’s greatest asset, it’s not a bad pic and would probably make a nice wallpaper for a 4K screen 🙂 There are a number of cool features in this region including “Mystic Mountain”, the Homunculus and God’s middle finger. It’s a small crop into a massive dominant nebula that is really easy to photograph because it’s so bright and crisp. Enjoy!